Dr. Larry Frank, who is the Bombardier Chairholder and Professor in Sustainable Transport and the Director of the Health and Community Design Lab at UBC, has been doing extensive research on the link between how we build our communities, and the health outcomes of people who live in those communities. At a recently Metro Vancouver Regional Planning Committee meeting, Dr Jat Sandhu from Vancouver Coastal Health Authority, Mr. Rob Barrs from MODUS Consulting, and he presented on the Health and Economic Benefits of the Built Environment. The following graphic shows the link between transportation investments, people’s health, and the cost of providing health services. Auto-oriented communities are more costly to human health than walkable, transit-friend communities. How transportation and land-use impacts human health and healthcare costs. Select image to enlarge. For example in San Diego, Dr. Frank found from a 2012 study of 18,000 people that there was a 10% reduction in Type II diabetes risk and 15% reduction in cardiovascular disease risk for people living in a more walkable and transit-friendly environment. Study's conceptual framework. Select image to enlarge. 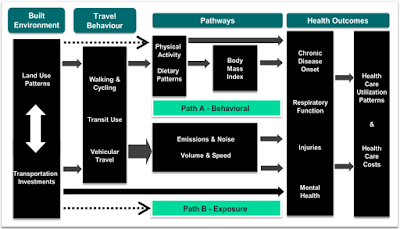 Hopefully having more local data about the link between land-use and health outcomes will cause both local and provincial governments to plan for and build transportation systems and support land-uses patterns that make people healthier.